Chabad's new Student Executive Leadership Team for the 2008-09 School Year (l-r): Rebbetzin Sarah Goodman, Rabbi Baruch Goodman, Marina Pekelis, Uri Kapilovich, Ben Bouskila, Sam Atlas, Michael Schaier, Jon Mirhige, Josh Gorden, and Adam Goldberg. "The unity we have today with everyone coming together on this beautiful day and at this fair to promote communal involvement should continue throughout every day of this coming new year!" exclaimed Rabbi Baruch Goodman, Campus Director of Chabad House Jewish Student Center at Rutgers University, as he opened the massive freshmen orientation event with a speech and the blowing of the Shofar. "This is a Shofar - not a beautiful instrument by any means; it's not a french horn, nor is it a trumpet or even a tuba; it's a simple rams horn, representing a simple collective voice directed to the One Above to express our need for Divine assistance in brining the world to a state of peace and harmony for all humankind." The Shofar was then sounded by Daniel Dinowitz, Chabad House Student Executive Leader and Rush Chair of Rutgers' SAMMY Fraternity, meeting with cheers and applause from the 5,000 student event. 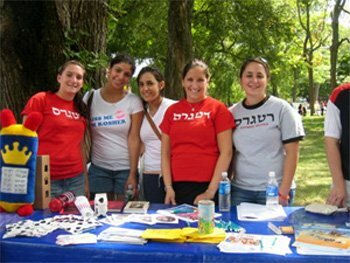 students participated in Chabad House's open house events that took place from Labor Day Weekend through this past Sunday. 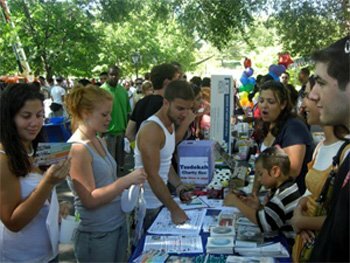 Free Jewish giveaways were received by students as they passed by the Chabad Table, including a Pushka (Tzedokah box), Israeli Tzahal posters of IDF Soldiers at the Western Wall, Shabbat Candle Sticks, mini Tehillim (Psalms) books, Chabad's popular Torah stickers, as well as pens and t-shirts. 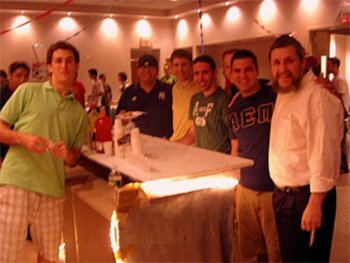 Chabad Vice-President Adam Goldberg and Rabbi Goodman welcome brothers of Rutgers' AEPi Fraternity to Chabad House's Open House event. "The response was overwhelming," commented Chabad Student Executive Co-Shabbat Director Becca Fish (RU '10). "It is very encouraging to see so many incoming students so positive about what we are offering and the exponential increase in participation over last year. With handling so many new students, I don't know how I'm going to keep up with my own school work! But the programs are fun and inspiring, which is what keeps me going." 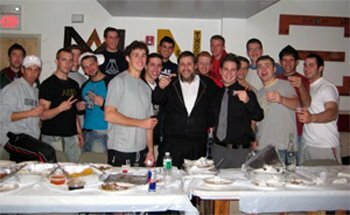 Student Treasurer Michael Schaier (RU '09) added, "Students this year are particularly receptive to Chabad's message of bringing the entire Rutgers Jewish community together as one, transcending such differences as diverse levels of observance, education and beliefs. Upon hearing our intro that at Chabad, we dispense with orthodox, conservative and reform labels, and focus on getting Jews together as one family, one new student commented saying that's the way it should be." 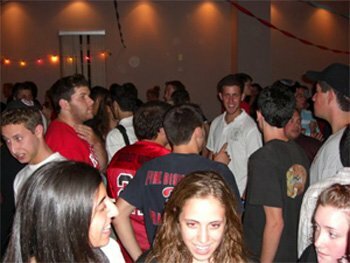 Chabad is now gearing up for the Jewish High Holidays preparing to offer free synagogue student services, meals and holiday awareness programs and parties on all five Rutgers campuses.